We are a full-scale retail grocery store in the heart of Bismarck, ND. We are a consumer-owned food cooperative which means we are owned by our members, but everyone is welcome to shop, eat, and enjoy! Our bright and beautiful produce department offers a wide range of produce, almost always organic when available. Our goal is to offer North Dakota-grown and certified organic produce and to work with growers who use sustainable certified practices when possible. Some of the local producers we work with include Forager Farm, Hiddendale Farm, Hillview Farm, Riverbound Farm, Skyline Ranch, and Farmtastic Heritage Food Hub. You will find unique items that can only be found at the co-op and our knowledgable staff will be able to answer all of your questions! Our bulk department offers a wide variety of foods that allow you to reduce packaging waste while saving money. You can choose from a large variety of bulk herbs and spices, whole grains, local beans, flours, granola, nuts, dried fruit and baking supplies. Customers are welcome to bring their own containers if they wish - we'll be happy to pre-weigh them for you at the checkout till. Our grocery department is full of unique, delicious and healthy items that are free of artificial sweeteners, colors, and preservatives. 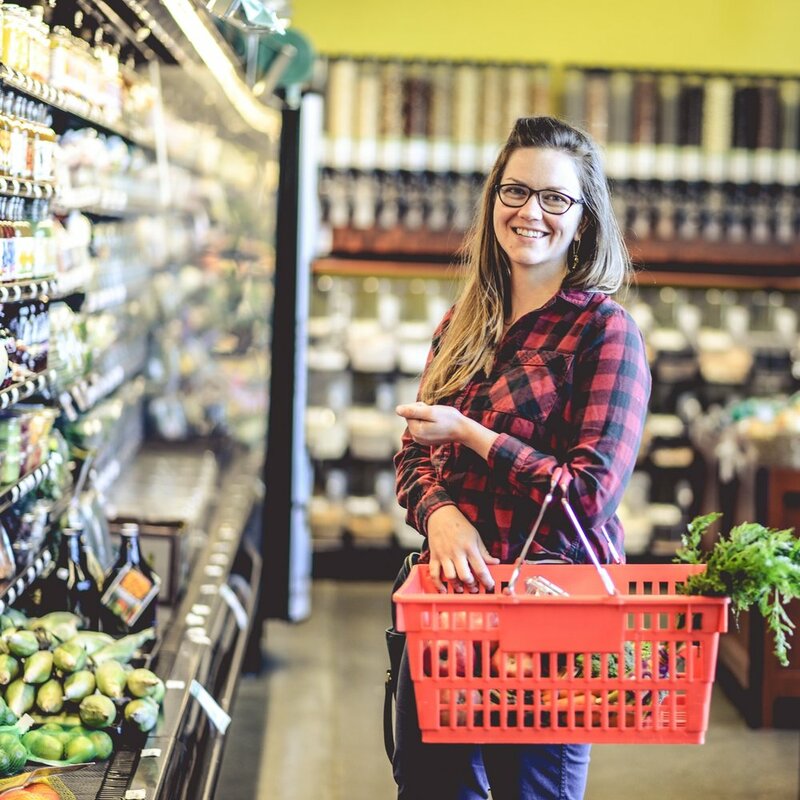 We strive to carry as much organic and non-GMO choices whenever possible, and offer locally produced items such as honey, jams, dog treats, and more. In the grocery aisles, you'll find organic spices, unique baking supplies, a variety of alternative sweeteners, fine oils and vinegars. And you'll appreciate the unique, all-natural selection of salad dressings, soups and stocks, pastas and sauces, chips, and more! We also carry a wide variety of interesting beverages and snack foods for you and your family. Our Meat and Seafood department is the talk of the town! We cut all of our meat fresh, grind our own beef, and make our own brats in-house. Just like the good old days! We carry organic chicken, grass-finished beef, pork, bison, lamb, and proudly sell a variety of Coastal Seafood. Our producers are committed to sustainability- they raise their animals responsibly with consideration for the long-term health of the environment and the livelihood of the people that depend on the environment. We proudly sell the following ND products: Reiser Ranch, Wild Prairie Beef, Nourished by Nature, Morning Joy Farm, Top Notch Custom Meats, and Hiddendale Farm. We are a specialty coffee shop serving responsibly sourced, fairly traded and locally roasted coffees from around the world. We offer fresh made ORGANIC juices and smoothies in addition to several unique beverage options for non-coffee drinkers. We also carry house made baked goods AND locally made pastries shops that we partner with. Sit and savor at the co-op cafe! We have several options to choose from including gluten free baked items, cookies, espresso, fresh pressed juice, and lunch options galore! You'll find a large salad bar including soup made daily, fresh, local greens, tasty cold salads, vegetarian and vegan options, and yogurt parfait bar. We have a daily lunch specials in addition to our core items that include a pepper-steak burger, wraps, quesadilla's, and panini's. Our Grab 'n Go items include sandwiches, deserts, kombucha, and several non-dairy beverages. CLICK HERE for menu. Our Health and Wellness department provides you with vitamins, supplements and beauty care products as natural and simple as the food here! Whether you want to enhance or preserve your health, our knowledgeable staff can help you find what you are looking for. We pride ourselves in supplying items that are certified organic, non-GMO, vegan-verified and/or gluten free. If we don’t carry what you are looking for let us know and we are happy to order it if possible, some of our best products have come from customer suggestions. Let our unique selection help you achieve your full potential!